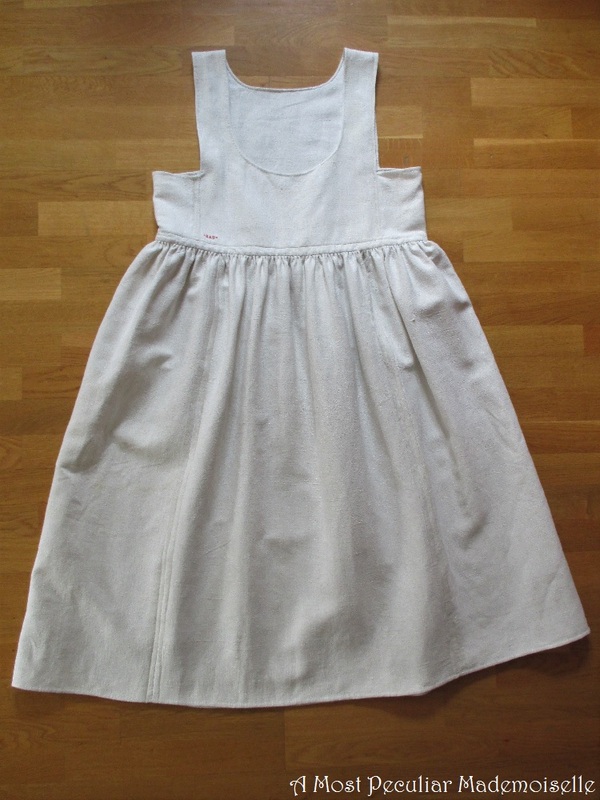 Some years ago I made a hankasärk, a sleeveless shift from the very South of Sweden, to wear with my folk costume. Now I’m working on a Ca 1810 everyday version of that folk costume for an event I hope to attend in a few weeks, and need a new hankasärk. The old one is a bit too loosely woven for my taste, and a smidge tight. In the beginning of March I made a new one, but I never got round to blogging about it until now. I had the cover of an old mattress, probably used in the early/mid 20th century in a military or hospital setting. 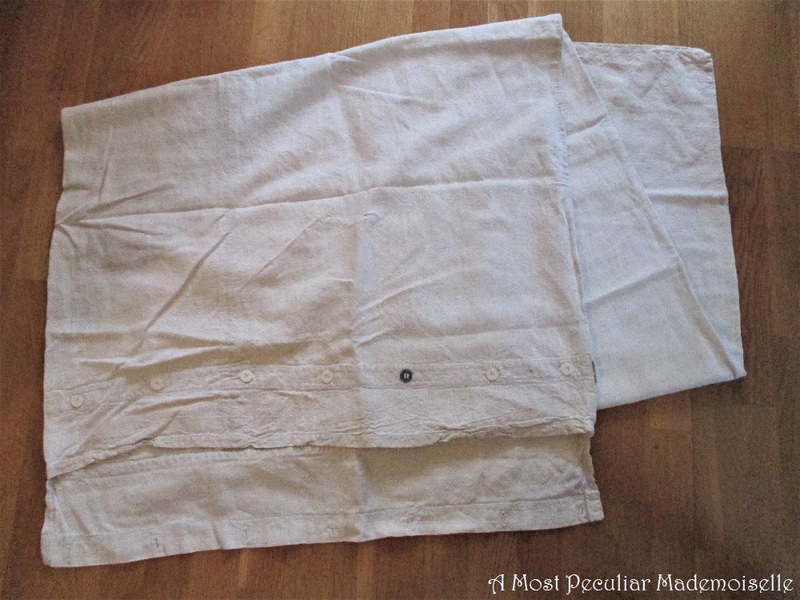 It was made from a very sturdy, handwoven linen, and though it was stained here and there and had a few unsightly mends, I thought I could get a hankasärk from it. The densely woven fabric, with nice selvedges, was too good to pass up. I had a 1:10 scale pattern, taken from an extant hankasärk, that I used as a guide when making my first one, so I knew what the pattern pieces should look like, and I looked at pictures of extant hankasärkar to see what similarities and variations there were. I then decided on the measurements for mine, measured on the fabric, and cut to a thread. All the pieces are rectangles of various sizes: one for the front and back (there are no shoulder seams), one in each side, two narrow ones to form the waistband, and four to make up the skirt. In the originals there are usually three skirt panels, but my fabric was a bit narrower than the ones originally used, so I chose to use four to get a similar width in the finished garment. 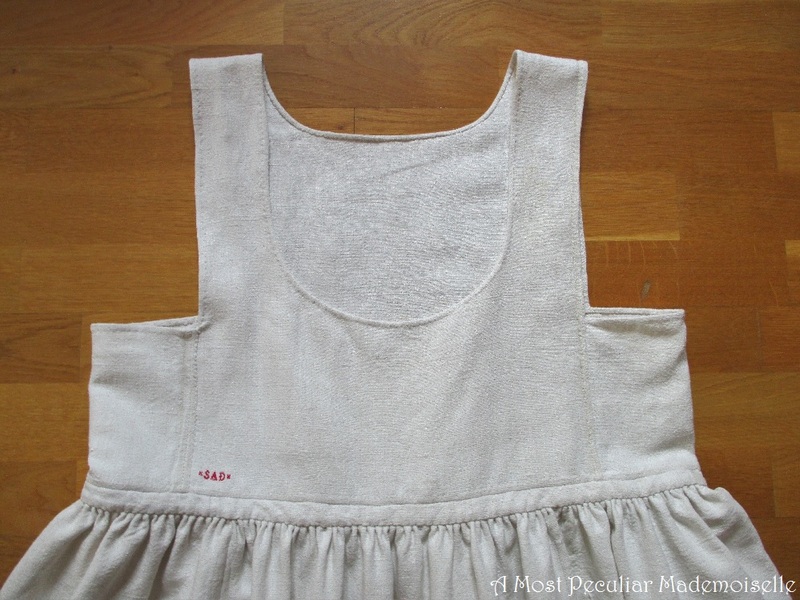 The bodice part is made up with back stitches, with all seams neatly felled to one side. I then hemmed the sides, that would be arm openings. 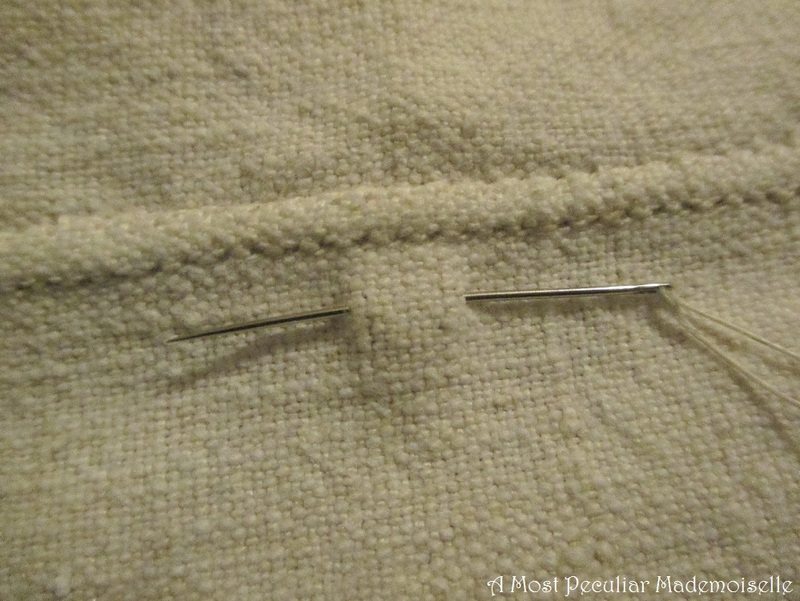 After doing this I discovered that I’d sewn one side inside out – oops. Several friends advised me to let it be; similar mistakes are seen in extant shifts. I pondered what to do while working on the skirt part, and then unpicked the armhole hem that was inside out, and stitched it again, to the right side this time. I left the side seams be though: they were discreet enough not to bug me. All seams and hems were made as narrow as the fabric would allow. The skirt panels had neat selvedges, so to make maximum use of the width, I whip stitched them together. This made almost completely flat seams when pressed. As I have upcycled the material, there are holes from the previous seams, but hopefully they’ll mostly go away in the wash. 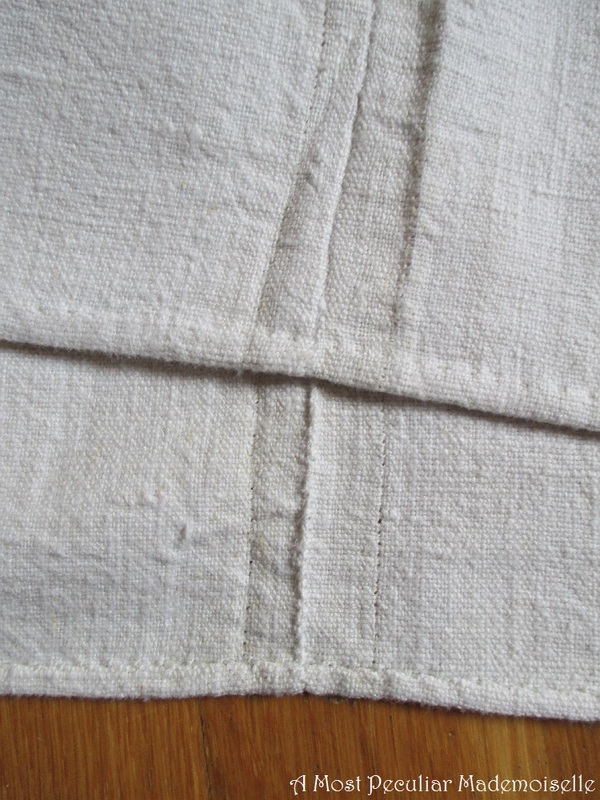 The skirt is attached to the waistband with stroked gathers. They turned out a bit less tight than I’d wanted (I might be bit wider than the original wearers, or I didn’t do the gathers fine enough), but it’s acceptable. 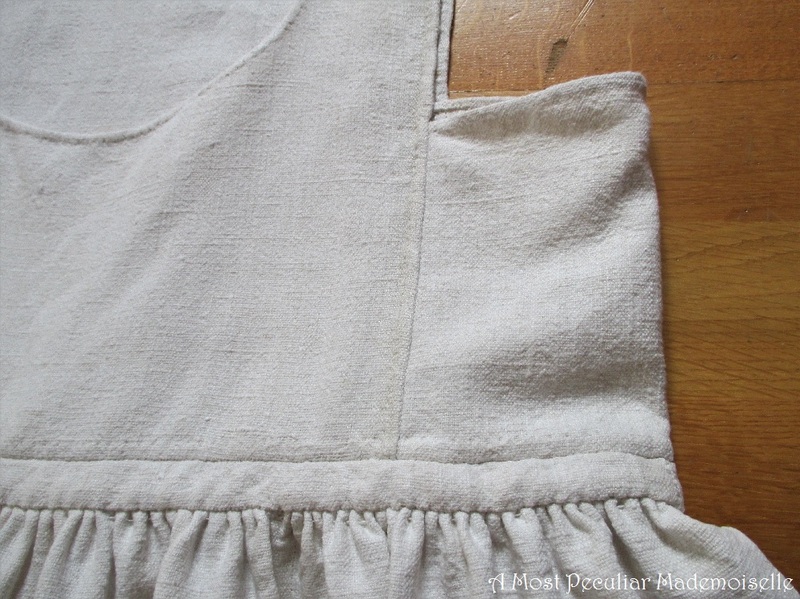 The waistband and bodice (with all edges, including the bottom, hemmed) were then joined by whip stitching. I managed to avoid the worst stains when cutting out the hankasärk, but there are still a few fainter ones. I decided not to let them bother me though. There were also the few holes that had been mended by machine. Though reasonably well done, machine mending on a shift I intend to be from well before a proper sewing machine was invented just wouldn’t do. 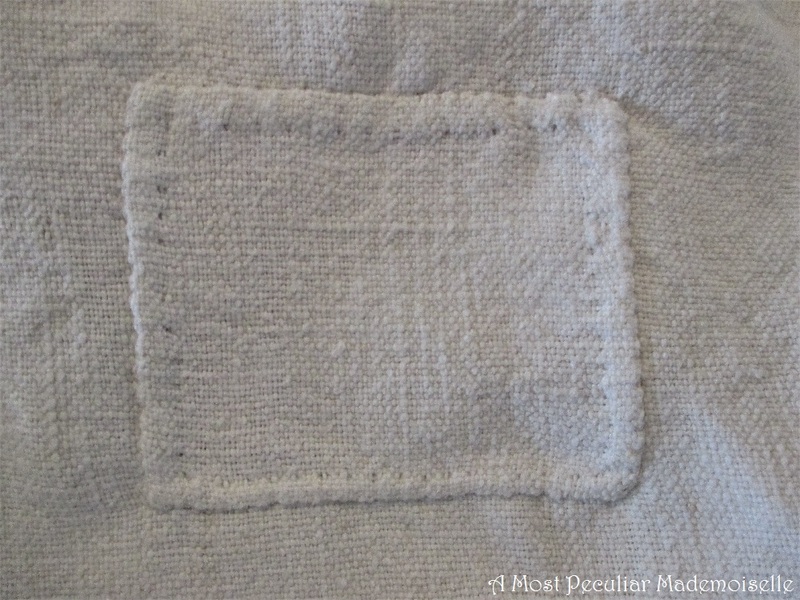 I unpicked the mending, and redid it by mending a larger hole with a patch, and two smaller ones by sewing/weaving linen thread over them. These flaws make the shift look well worn and cared for, something I don’t mind at all. There’s no fun in looking all sparkling new, like you wore a fancy costume instead of proper clothes, especially not in a lower class living history setting. 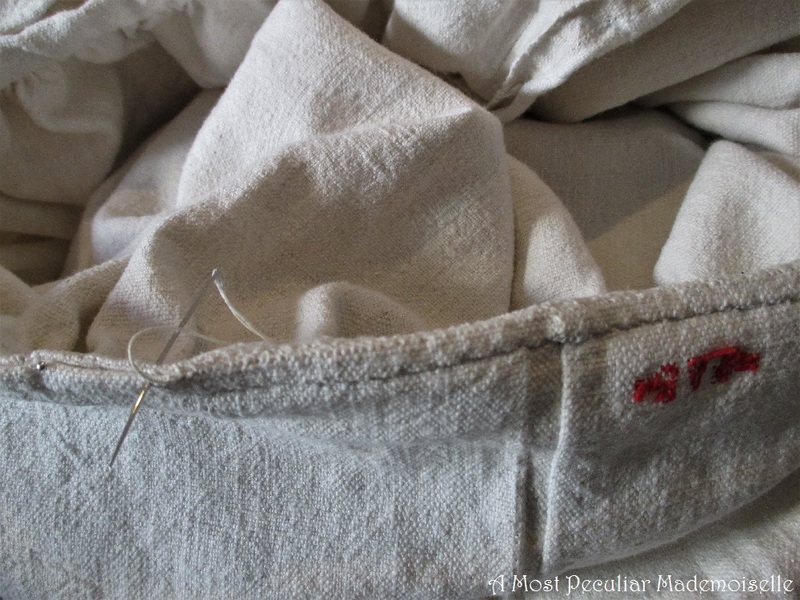 For all sewing I used linen thread that I strengthened with bees wax. 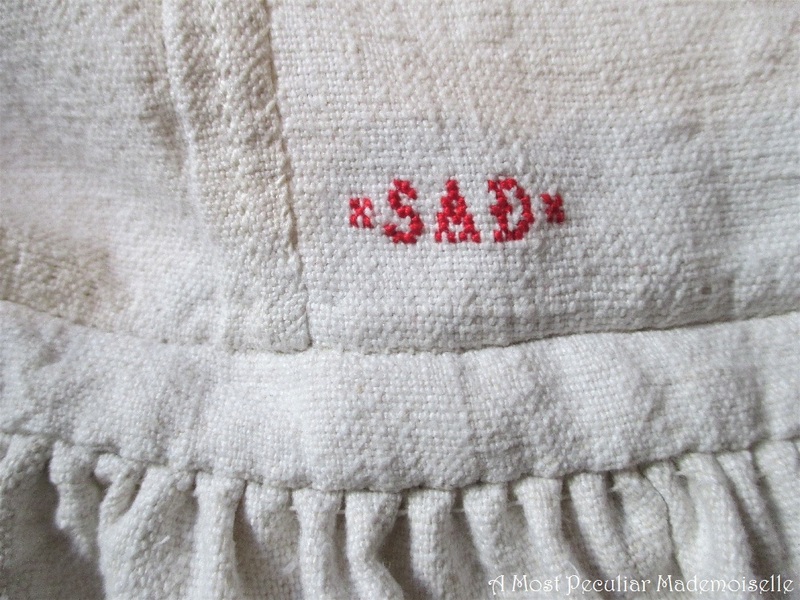 For the monogram – common in large households in a time were all linens looked more or less the same – I used cotton embroidery floss. Most people in early 19th century Sweden used patronymic surnames, so the first letter stood for the person’s first name, the second for their father’s first name, and the third for son/daughter. It’s a practice still used in folk costumes. You can also see the seam that ended up wrong side out. 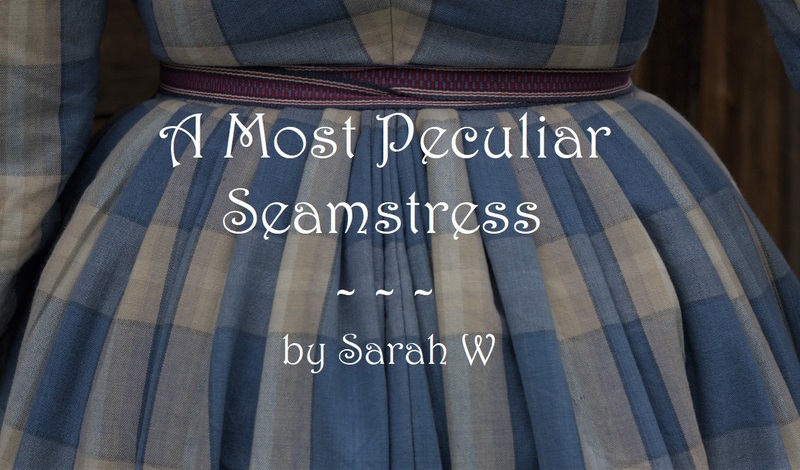 This will be my first entry in this years’ Historical Sew Monthly. It could have fit under February’s ‘Re-Make, Re-Use, Re-Fashion’, but obviously itwas too late for that, so instead I’ll put it under April’s ’Circles, Squares and Rectangles’. The Challenge: #4 Circles, Squares and Rectangles. Pattern: Based off of period examples. Notions: Linen thread, bee’s wax, cotton floss. How historically accurate is it? Pretty close in both material,construction and sewing. First worn: Hopefully at an event in a few weeks. Total cost: About 50 SEK (5,25 Euro, £4,49, $5,6), not counting the work. Thank you for sharing! It's interesting to see how folk costume garments are sewn, and your Pinterest board really shows how varied the costumes in a parish or hundred were, compared to many of today's folk costumes. Good luck with your sewing, and I hope you'll post photos of your outfit after the event! What a beautifully made garment. I first thought, it's an original you used to base your reconstruction on 🙂 Well done! And yes, I love the variety of the original clothes and would love to see more of that in today's folk costumes, which are more often than not very uniform in my area. This is awesome, thank you for sharing! I am always wondering what people wore in Finland and Sweden. Lycka till med din sy(ing). Haven't learned that form just yet. New immigrant to Finland, Swedish speaking Ostrobothnia. I haven't shared my HSF garments yet, but you have motivated me to do so. Thank you!